OFA is a unique creature. It is creepy. It’s not a permanent political apparatus and is not intended to be. It’s goal is to serve only one man – Barack Obama. It’s a permanent personal apparatus built around one man, meant to reinforce his cult of personality. It is meant to identify his unique racial status with those of the demographic he identifies with. It is a “unique opportunity” to milk his ascension for all its worth. As a representative of ACORN wrote in 2009: “ACORN’s grassroots leadership believes we are experiencing a once-in-a-generation opportunity and must not squander this moment.” OFA is the machinery put in place to make sure the DNC doesn’t squander this moment – the election of a man like Obama. There has never been any intention of making the group a permanent component of the Democratic Party. 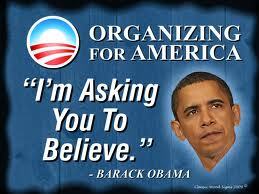 OFA has precious little to do with any permanent goals of the DNC. And “Project Vote” is its affiliate organization — its voter registration arm. 1 Response to Where Oh Where Has ACORN Gone? Have the Nuts Multiplied?